OVER ten governors of the All Progressives Congress (APC), under the Progressives Governors’ Forum are expected to join the Vice President, Professor Yemi Osinbajo in flagging off the governorship campaign of the candidate of the party in the September 10 governorship election in the state, Mr Godwin Obaseki, at the Samuel Ogbemudia Stadium Benin City today. 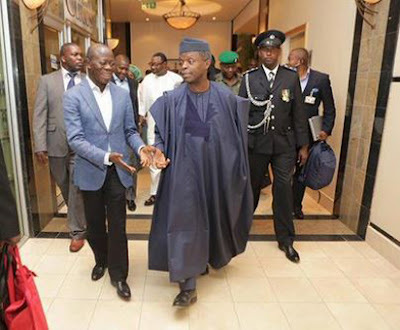 Oshiomhole-Osinbajo Meanwhile, over one thousand police officers and the anti-bomb unit of the state Police Command took over the Samuel Ogbemudia stadium Benin City Friday with a view to ensuring a hitch free exercise. Disclosing the presence of the APC governors for the event, Oshiomhole said,”while the PDP couldn’t get any national person of note to present a tattered flag, our own national chairman will be around, as a former governor, former federal Permanent-Secretary and National Chairman of the governing party to present the flag to our candidate. And my brother governors will be coming from Friday, all the Progressives Governors will be here to show solidarity. We are not going to be represented by one governor. The Governors will come.” Asserting that the flag off will signal the final death of the PDP in the state, the state chairman of the APC, Anslem Ojezua who briefed newsmen, said “as I am speaking with you now, we already have about five APC governors in the state and more are being expected. Our Vice President will be arriving tomorrow morning. “This is for all Edo people and you will see them at the stadium tomorrow. We are not PDP that went to hire crowd to pretend that they have people when they have no body. We are also going to see tsunami because notable PDP leaders will be defecting to the APC today. We are not talking about just PDP members but those who are the foundation members of the PDP in Edo state. “They are tired of the tattered umbrella so they want to move to a progressive party. They have seen the difference between the PDP and the APC, while the APC government has worked for them very sincerely in the past seven and half years, the PDP was here for ten years and nothing was achieved. These people are elders who want something good for their people and they are going to help achieve victory for APC in the coming election. “This is the time to show appreciation for what the APC government has done by voting in another APC governor. Oshiomhole has done well and that is why you see a lot of people dumping the PDP for the APC across the state. But Saturday’s rally will be the final burial of PDP in the state” he stated.